Still shaking my head at my site having won the Science Writers and Communicators of Canada’s “2018 People’s Choice Award for Best Canadian Website“. It is a People’s Choice Award so the winning is because of YOU. Please see below from my interview with Trish Weatherall for the North Island Eagle where I try to express what the award means. Below that interview, I have included a listing of the other sites nominated for the award. Included are their social media links to make it easier to follow these great science resources. Thank you so much for your support and belief in “The Marine Detective”. The Marine Detective has gone national! 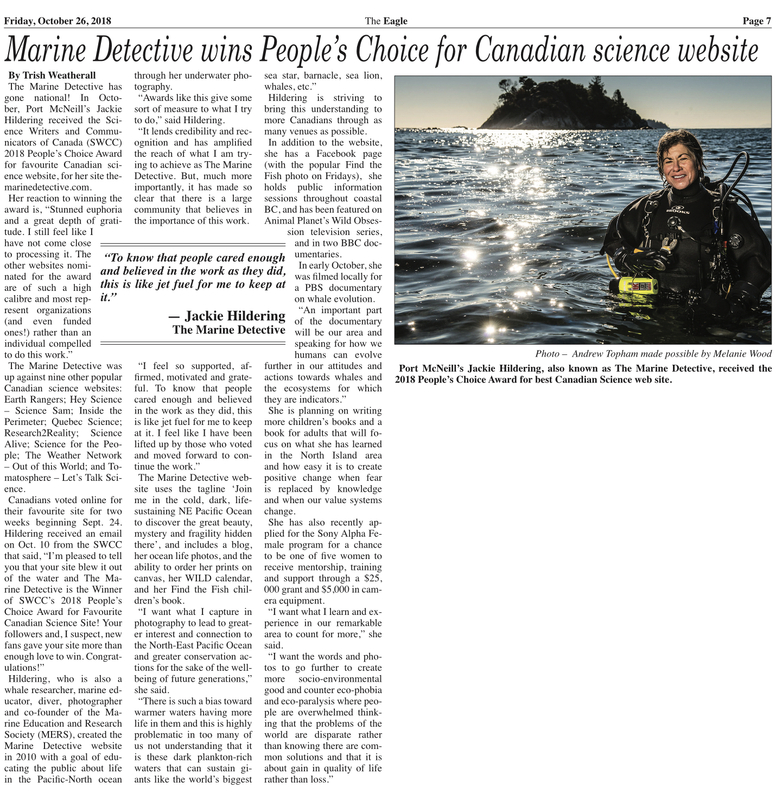 In October, Port McNeill’s Jackie Hildering received the Science Writers and Communicators of Canada (SWCC) 2018 People’s Choice award for favourite Canadian science web site, for her site themarinedetective.com. Article as it appeared in the North Island Eagle. Click to enlarge. Hildering, who is also a whale researcher, marine educator, diver, photographer and co-founder of the Marine Education and Research Society (MERS), created the Marine Detective web site in 2010 with a goal of educating the public about life in the Pacific-North ocean through her underwater photography. 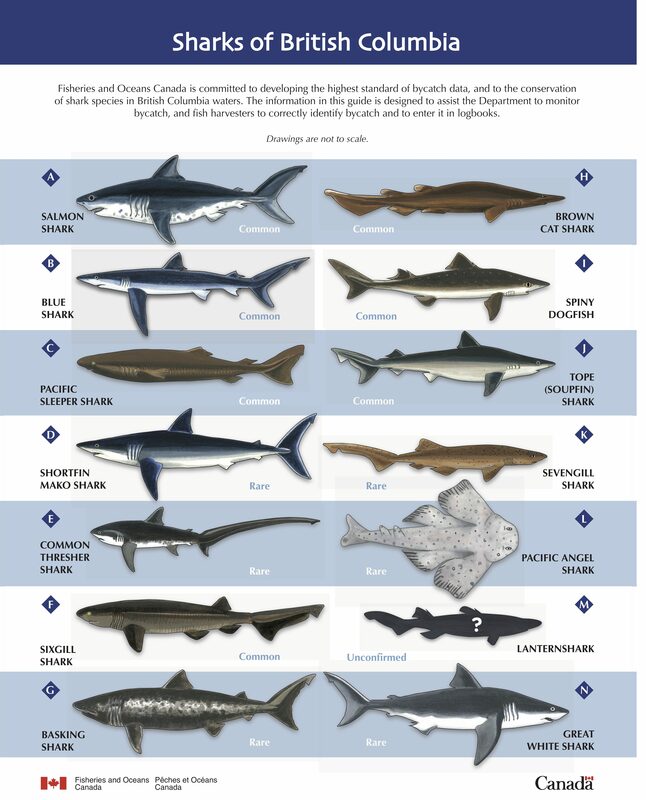 The Marine Detective web site uses the tagline ‘Join me in the cold, dark, life-sustaining NE Pacific Ocean to discover the great beauty, mystery and fragility hidden there’, and includes a blog, her ocean life photos, and the ability to order her prints on canvas, her WILD calendar, and her Find the Fish children’s book. Hildering is striving to bring this understanding to more Canadians through as many venues as possible. In addition to the web site, she has a Facebook page (with the popular Find the Fish photo on Fridays), holds public information sessions throughout coastal BC, and has been featured on Animal Planet’s Wild Obsession series, and two BBC documentaries. In early October, she was filmed locally for a PBS documentary on whale evolution. She is planning on writing more children’s books and a book for adults that will focus on what she has learned in the North Island area and how easy it is to create positive change when fear is replaced by knowledge and when our value systems change. She has also recently applied for the Sony Alpha Female program for a chance to be one of five women to receive mentorship, training and support through a $25,000 grant and $5,000 in camera equipment. What’s making local waters this amazing milky turquoise colour you would expect for the tropics? It’s a question I’ve been asked a lot by those on the northwest side of Vancouver Island recently (and undoubtedly its being seen elsewhere too). It’s a Coccolithophore bloom. Coccolithophore bloom near Port Alice – July 2018. Photo: ©Harvey Prescott. Thank you Harvey! Coccolithophores are a group of plant-like plankton (phytoplankton). Coccolithophores are single-celled and have been around for some 220 million years (give or take a million) and there are now more than 300 species. This bloom is likely due to the Emiliania huxleyi, abbreviated as “Ehux” (like the way Tyrannosaurus rex is known as Trex). In addition to the aesthetic beauty of the colour, there’s often bioluminescence during a Coccolithophore bloom. It’s very worth it to go for a night paddle to see the magic. Coccolithophores are not believed to create bioluminescence. Thereby, the light would be due to another plankton species in the mix, giving off light when physically disturbed most likely to reduce predation. The colour of the ocean changes because of the “armour” of round calcium carbonate plates Coccolithophores produce and shed. These plates make Coccolithophores unique in the plankton world. They essentially have a suit of armour made of calcium carbonate. The plates act like incredibly small mirrors / sequins making the sunlight reflect back out of the water. Electron micrograph of the Coccolithophore Ehux. Source of the electron micrograph – University of South Hampton. Because of the reflective properties of the plates shed by Coccolithophores, the blooms can clearly be seen from space (click here for satellite images of Coccolithophore blooms). It’s reported that Coccolithophores do really well in areas where the temperature is moderate, the sun is usually out, the water is calm, and nutrient levels are lower. These conditions allow them to flourish and outcompete other species of phytoplankton. Coccolithophore bloom near Port Alice – July 2018. Photo: ©Harvey Prescott. Their impact on the environment is complex, as is of course most often the case in an interconnected system. More algae generally mean more food for the food web. Since Coccolithophores do well in nutrient-poor areas, this means they are an important source of nutrition where other phytoplankton may not be able to thrive. However, in areas where there are more nutrients, the increase in Coccolithophores may lead to a shift in what species of phytoplankton are fuelling the food web rather than to an increase in the amount of nutrients. Coccolithophores also influence the amount of the climate-changing carbon dioxide in the atmosphere but the net impact is not fully understood. The plates contain carbon (CaCO3 = calcium carbonate) which would be expected to lead to reduced carbon dioxide levels in the atmosphere as a result of carbon being fixed into their bodies and plates in their plates, ultimately sinking to the ocean bottom. However, the process of calcification, by which they produce their plates, increases the levels of carbon dioxide in the atmosphere (source ScienceDirect). Calcium carbonate is alkaline so the large scale shedding of the shells can also influence ocean pH. With regard to additional impacts on temperature, the high reflectivity of the plates causes light and heat to be reflected rather than absorbed by the ocean. Also, Ehux contributes to the sulphur cycle by releasing dimethyl sulfide when feeding. Dimethyl sulphide contributes to marine cloud formation and climate regulation (source ScienceDirect). Oxygen levels: Coccolithophores are phytoplankton and thereby photosynthesize, producing oxygen. However, to be considered in areas with low current, is that the large numbers of Coccolithophores sinking to the ocean bottom and decaying (consumption by bacteria) could lead to less oxygen being available to other organisms (hypoxia). This is not a concern in high-current areas. In addition to EHUX being of great interest to science regarding why they flourish and what this means for the environment, they are also fo interest for biotechnology and geology. They produce “polyketides” that are of interest for antimicrobial, antifungal, antiparasitic, and antitumor properties (source JGI Genome Portal). They make up a large part of the sediment of the ocean and allow for information to be gained about the earth’s history. Know too that their bodies, over large expanses of time, become incorporated into rock e.g. the White Cliffs of Dover (source University of South Hampton – EHUX). Hoping this information about the bloom of Coccolithophores enhances interest in the microscopic life that has such an impact on our day-to-day lives AND an appreciation of the the complexity of the biochemical processes that maintain life on our BLUE planet. Moonstar (BCY0767) the Humpback during a Coccolithophore bloom in 2016 in parts of Queen Charlotte Strait and inlets of the Broughton Archipelago. Photo: ©2016 Jackie Hildering. University of South Hampton – EHUX. Friend Captain Andrew Hyslop during a Coccolithophore bloom in the Strait of Georgia in 2016. Photo ©Richard Scott-Ashe, August 21, 2016.